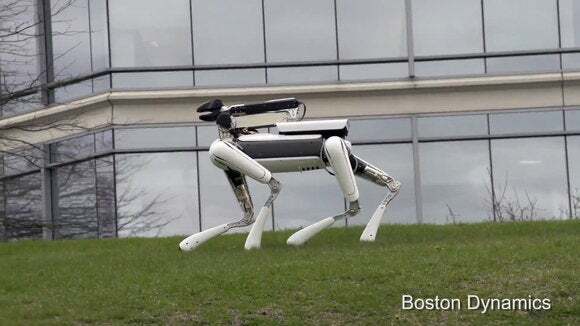 Boston Dynamics, the Google-owned robot maker that's apparently up for sale, has a new four-legged robot small enough to walk around a house, agile enough to load your dishwasher, and not quite clever enough to avoid banana skins on the floor. 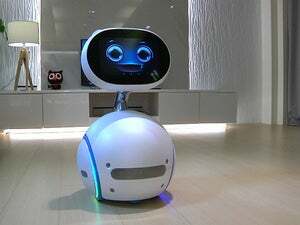 Called Spot Mini, it's a smaller version of the company's Spot robot. Spot was developed for use by the U.S. military and took part in tests with Marines last year. In a video posted to YouTube on Thursday, Spot Mini is seen in several configurations. In one it has a prominent LIDAR laser imaging sensor on top of its body and in another is an arm with a gripper on the end. 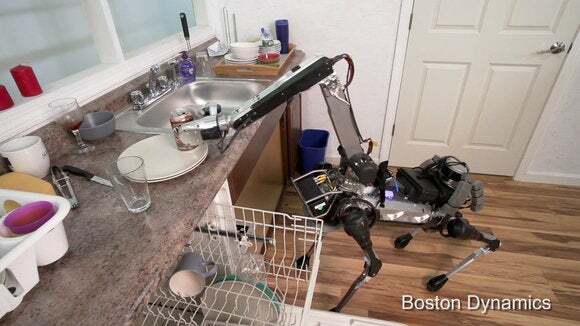 Boston Dynamics' Spot Mini robot picks up a can in a video released by the company on June 23, 2016. That combination makes it look something like a snake on a robot body and could be the stuff of nightmares for some people. It's demonstrated extending the arm to pick up a glass and place it in a dishwasher and pick up a can and drop it in the trash. Both Spot and Spot Mini are among the most sophisticated robots developed, but they are not perfect. In one scene, the robot can be seen walking into a cabinet. In another, it fails to notice banana skin and slips and falls. 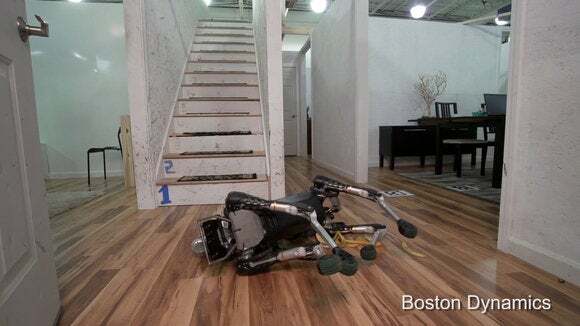 Boston Dynamics' Spot Mini robot takes a tumble in a video released by the company on June 23, 2016. And in the final scene of the video, the robot attempts to hand a drink to a person but doesn't quickly release control of it. When it does, it seems to attempt to take the drink back, and the robot falls over. Even these failures can be demonstrations of the robot's abilities. In most cases, when a robot falls it needs to be picked up, but Spot Mini can use that extending neck and gripper to push itself up.